There are lots of ways you can use Banners.com products to decorate your house and yard for Halloween. 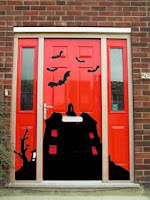 If you are looking for a complete window display, you can order a Halloween window perf mural. The image would have to cover the entire window and is applied to the outside of the window. You will still be able to see out the window to some degree, and the mural will be visible from the outside. If you don't want to cover your whole window, you can get shape cut decals for your windows. If you want to cover your garage door or house door, you can do a custom Halloween wrap. You can print your designs on one of our decal materials and apply it to the door. You can design a custom Halloween flag to display in your house or yard. The flag can be reused every year. 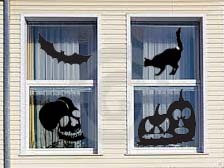 You can go the extra mile with your Halloween decorations and print out cut outs to display in your yard. Our yard sign material can be cut into custom shapes for you to put in your yard. You can make gravestones, monsters and ghosts. The decorations can either be single sided or double sided. The cut outs are lightweight and can be used year after year.